The tobacco is very strong. Only one puff will do it! Wapaaqa [tobacco]. Just like we do, they call them kuynga [“pipe” in Chukchi]. Among the Chukchi, Koryak, and Siberian Yupik, few people did not use some form of the tobacco they obtained from Russian traders. The strong leaf was chewed, smoked, and prepared as snuff. 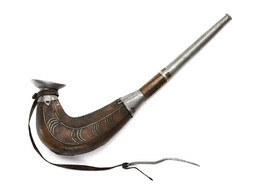 This Chukchi pipe has a wide wooden body with a lead bowl, fittings, and stem made of cast lead. Designs are inlaid with brass wire. An iron pin, used to clean the pipe’s bowl, is attached by a leather strap.